The top career EPA official responsible for safeguarding the nation's drinking water supply couldn't say yesterday how Administrator Scott Pruitt's controversial move to restrict the types of scientific studies the agency can use might affect its efforts to protect the public from toxic nonstick chemicals. "I think the important thing to focus on related to that proposed rule is that there are a variety of different perspectives," Peter Grevatt, the director of the Office of Ground Water and Drinking Water, said in an interview with E&E News. "We're not thinking through at this stage, trying to prejudge the outcome of that whole process." Referring to per- and polyfluoroalkyl substances, a class of stain- and fire-resistant chemicals linked to cancer and developmental problems, Grevatt said, "We will be focused on the best science that's available in addressing PFAS compounds, but also all the other potential public health concerns we have related to drinking water." EPA concluded a two-day summit yesterday that focused on combating the health threats posed by PFAS chemicals, which the nonprofit Environmental Working Group estimates are present in drinking water systems across the country that serve up to 110 million customers. The agency restricted press access to the first day of the summit and entirely barred reporters from the second day's discussions among state and federal regulators, prompting outcry from the Society of Environmental Journalists and other media professional organizations (E&E News PM, May 23). After turning away E&E News from the summit for the second day in a row, EPA offered to make Grevatt and his boss, Assistant Administrator David Ross, available after the event. A spokeswoman later said "something has come up for Dave and he won't be able to make it, so we'll just move forward with Peter." The interview was conducted at the agency's headquarters building with two communications aides and a water office staffer. It took place in a small conference room decorated with children's artwork and a whiteboard with a single quote on it from Dr. Seuss: "Sometimes the questions are complicated and the answers are simple." When the drinking water chief was pressed on how the science proposal — which would likely prevent EPA from considering pollution studies that include confidential medical records — could affect Pruitt's promise to develop toxicity values from GenX and PFBS, two types of PFAS, he struggled to respond. "I'm not in a position to conjecture on how that might be impacted," said Grevatt, who has been at EPA since 1998. "I don't think I have the opportunity right now to give you specifics about what I think about that. I think the important point is that it's a proposed rule that the public is invited to comment and provide their perspectives on that and the agency will consider that as they move forward." Under pressure from public health and scientific organizations as well as some business groups, EPA has extended the comment period on the proposal to Aug. 16 (see related story). Grevatt also discussed his takeaways from the PFAS summit's closed-door session yesterday. One of the top priorities he heard from state regulators was around "risk communication and the importance of working together with states to develop tools to help states and local communities, together with the federal agencies, talk about these compounds with the public," he said. "There's a complex set of issues. And of course, PFAS in either contaminated sites or drinking water can raise very significant concerns for communities." Another recurring question, Grevatt said, was how to regulate the broad array of PFAS. "Do we start to think about them as a group rather than individually when there are so many?" he asked hypothetically. "If we say, well, let's understand the toxicity of this one and then once we check that one off, we move to the next, we may never finish that process." With that in mind, Grevatt suggested the agency may ultimately conclude it's better to address the challenges posed by PFAS via a rule establishing a water treatment best practice rather than setting maximum contaminant limits for thousands of similar but chemically distinct types of PFAS. At this point, however, Pruitt has promised to consider establishing binding limits for perfluorooctanesulfonic and perfluorooctanoic acids, or PFOS and PFOA. EPA has already set a health advisory for those PFAS, which U.S. manufacturers voluntarily phased out the use of in 2015. But PFOA and PFOS can still be found in products imported from China and other countries (Greenwire, May 22). "I want to make clear, as I give you these examples, that what the administrator committed to in the opening of the meeting was for EPA to focus now on working through the regulatory determination process under the Safe Drinking Water Act for PFOA and PFOS," Grevatt clarified. "That's not the same thing as committing to doing a regulation." 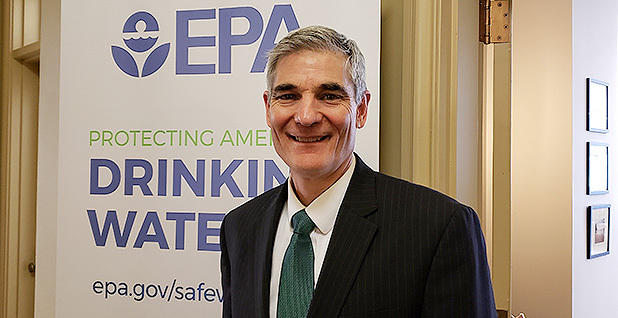 The drinking water chief also dismissed concerns raised by some state regulators that the agency's push to combat PFAS contamination could distract it from other priorities, like Pruitt's "war on lead" (E&E Daily, May 23). "It's really not a matter of choosing either-or, lead or PFAS," Grevatt said. "These are issues we're taking on together. And we benefit a great deal from the administrator's focus and leadership on these issues."